How to make candles at home, lots of ideas for you to choose from. Making candles is a great craft to learn and one of those vintage skills that we should keep alive. There are so many different ways to handcraft your candles, some easier than others. I hope you’ll find one of the methods I’ve included fun for yourself or as a project for the kids. Is it cheaper to make homemade candles than buy them? This is a hard one to answer. Yes, it CAN save you money to make candles at home yourself. This will depend greatly on the types of candles you want to make and what materials you already have available. I think the initial investment into candle making materials is the real expense. You can, however, consider making candles from recycled materials to save money. But the real considerations are using quality materials that you are burning in your home, learning the art of candle making and being able to customize the candles to your home or tastes. One of the biggest benefits to making your own candles is you’ll avoid toxic materials in many store bought candles. What are the best ways to make candles at home? There are so many different ways to make candles and I don’t think one is better than the other. As you try different methods and materials you’ll probably decide you like making certain types of candles more than others. I tend to make a lot of mason jar candles, because I can make them quickly and people love them. What materials are used to make candles? Like almost any DIY project you need to take a few safety precautions before you starting your candle making. Make your candles in a well-ventilated area, especially when using fragrances. I recommend opening a window in your work area. Always work on a flat surface. Having a dedicated area for candle making is best but if you have to work at a kitchen table be sure to protect it from getting hot wax and material on it. I use a plastic tablecloth. Protect yourself from hot wax. This is not the best barefoot activity, take it from me. You may want to consider wearing gloves when working with the hot wax. Always have a fire extinguisher available. I’ve never had to use it but you’re working with hot materials, so it is just a good idea. Do not put liquid wax down the drain – you’ll be buying new pipes if you do! Never leave hot materials unattended! Mason Jar candles are a perfect beginner’s candle. 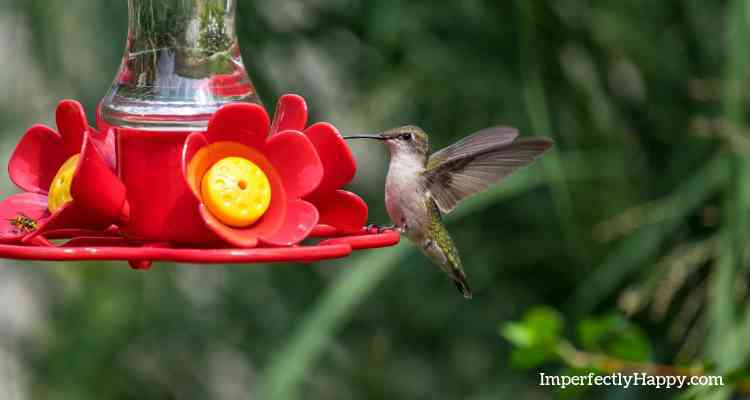 They are easy to make, take very little supplies and you can customize them in size, colors, materials, etc. People love the mason jar candles that I’ve given as gifts so I like to keep some on hand, just for gift giving. You can make a lot of these candles at one time, fast. Mason jar candles also store very well for emergencies. You can use beeswax to make lots of different candles, like the mason jars above. 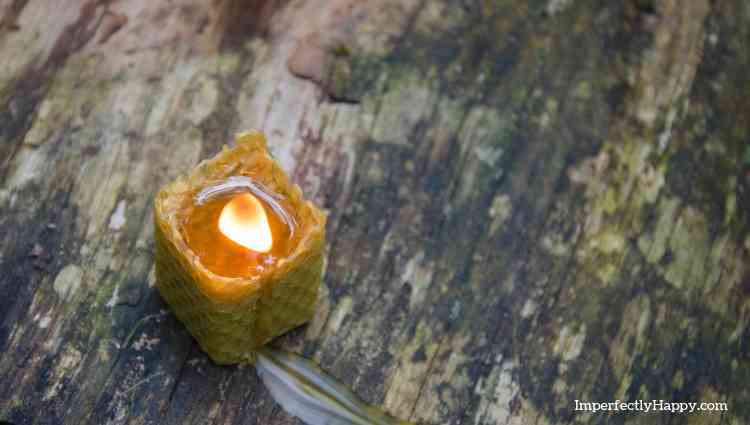 It is a much more natural material to use and people have been making beeswax candles for generations. Tallow candles are candles made from rendering beef fat. If you are really into learning vintage skills then you should render your own beef fat for tallow before making candles. It should be noted that tallow candles have a scent that not everyone appreciates so make just a few your first time. Soy candles are made from wax derived form soybean oil. Soy wax candles are generally made in containers but if you mix it with other materials than can be made into pillars as well. What are the benefits of a soy candle? Well they are said to be cleaner to burn than traditional candles. They also can last much longer than paraffin wax candles. 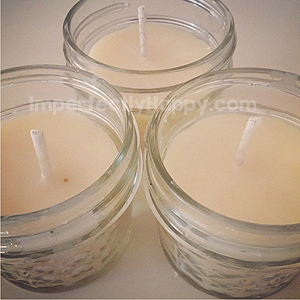 Because soy wax has little to no scent this makes it perfect for making scented candles. Did you know you can make new candles from old candles you’re no longer using? There are actually a few recycled candles you can make fairly easily! Another fun recycled candle project is to make some candles from old crayons. These make great teacher’s gifts too! A candle making project can be something fun to do with the kids as a craft or homeschooling lesson (think about the science of candle making and history of candle making). Of course you want to take ALL the safety precautions listed above first; and never leave a child alone with hot wax! The first candle I ever made was in Girl Scouts! It was an ice candle made in an old milk carton. I kept that for years and couldn’t bring myself to burn my candle because I was so proud of it. Find a fun candle making project that the whole family will enjoy! How do I start a candle making business from home? If you really love making candles you might want to consider doing it for profit. It could make a nice part time income doing something you already enjoy. Happy candle making my friends! Garage Sale tips are on the agenda today. It will soon be spring and that, to me, is the best garage sale season of all. But now is the time to get ready for your garage sale (yard or tag sale)! I have some tips and tricks to have a successful garage sale…the best one ever! Garage sale, yard sale, tag sale – I know we all call them something different depending on where we live; but it is all basically the same thing. A garage sale is a wonderful way to purge your home of items you no longer need or use and make some money to boot. Win! There are a few things you can do to go from a good yard sale to an amazing one! I am going to share what’s worked for us in the past so you can implement them in your next sale! We are getting read for our annual spring garage sale. I love to shop thrifty and yard sales are great for that too. BUT I have never found an easier way to make a little side cash than a good old fashioned garage sale. 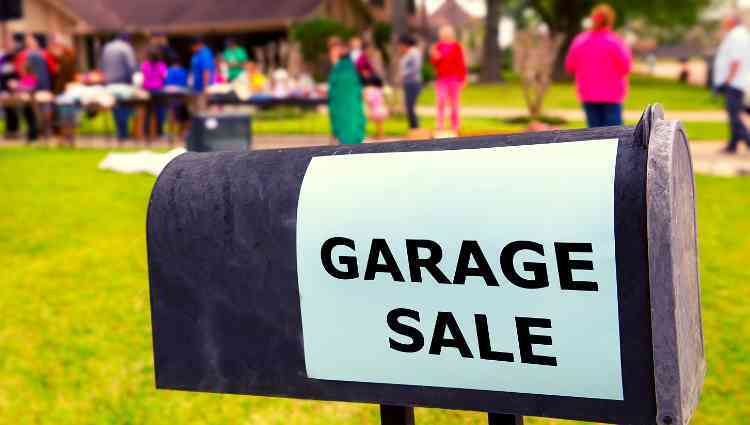 So what can you do to have a bigger, better and more profitable garage sale? I’m so glad you asked! 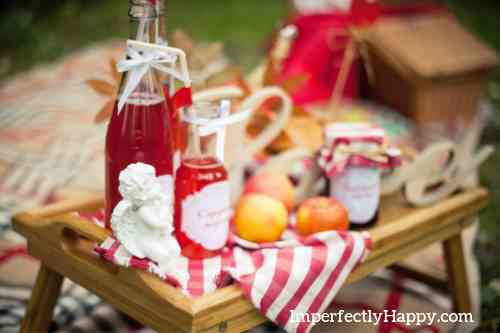 10 Tips for The Best Garage Sale Ever! If you want to have a spring yard sale then you should start planning it in the winter. Sure you can throw together of last minute sale, I’ve done that too. But for the BEST garage sale you want time to plan. Pick a date, put it on the calendar and plan around it. Depending on how much clutter you have to clean out, it could take several weeks or even months to get yourself ready. That’s ok! 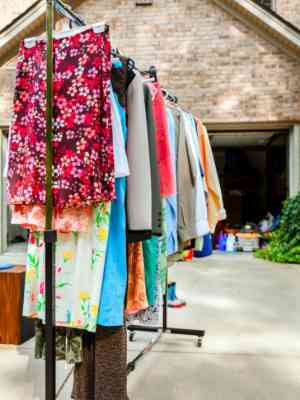 See if your area or neighborhood does annual or semi-annual garage sale. These group tag sales will bring bigger crowds which is a better opportunity for you to make money. Find out if your city or town requires a permit to hold a tag sale. Use 1/2 of your garage or a spare room in your house (if you can) to collect and organize what you’ll be selling at your garage sale. Organize items into groups like kitchen items, books, clothing, etc. This will make set-up on the day of your yard sale much faster. It is so much easier to have a great yard sale when you have a helper or 2. 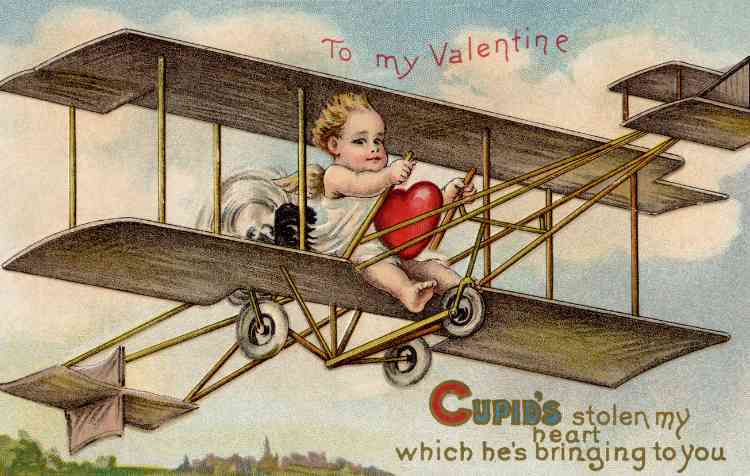 Normally this will be your spouse and maybe your kids but if you’re single ask a few friends to help. Make sure to offer friends some food / treats / drinks for their time. You could consider offering your garage sale volunteers a set percentage of the profits as well. Can you yard sale volunteers help you with the pre-sale organization? Even better! There are 2 schools of thought here. One says price high so people can haggle. The other says ask what you want because some people just want to buy without negotiating. I tend to fall a little in the middle. Most shoppers want to walk away feeling like that got a deal so give yourself some wiggle room in the prices. Price as you go. As your organizing and going through your rooms to find items to sell, price them right away. Make sure price tags are visible and shoppers don’t have to search for them. If you’re unsure what to price something check for similar items on Craigslist and Ebay. You really don’t need a newspaper ad anymore. Find local groups on Facebook to post your yard sale. If you don’t feel comfortable putting your exact address you can ask people to message you for it but that does make more work for you. Announce it on your personal social media. Add it to your local Craigslist with a few pictures of choice items. Post flyers at your local library. The day of, put out clean, easy to read signs with LARGE print. Keep your yard sale area neat and easy for shoppers to see what is available. Group like items together. Clothes with clothes – clothes are best seen and sold if they are hung up. Try hanging a heavy rope between trees or in your garage door area to hang the clothes. You can also invest in a garment rack. 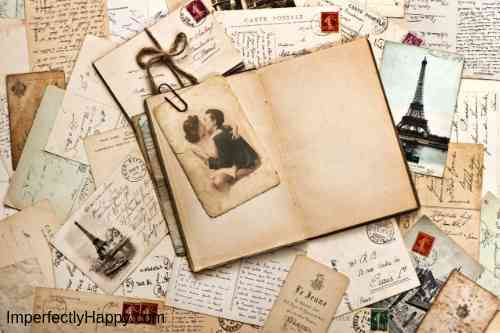 If not make sure everything is neatly folded on a table. Books with books – consider offering discounts when multiple books are purchased. Have a designated cashier for your garage sale so you can be in with the shoppers. Make sure you have plenty of small bills for change. You may want a way to check large bill for counterfeits (it happens). You can buy a Money Marker for this. Do not work your garage sale alone. In addition to a cashier you want 2 – 4 people “working” the crowd and sadly watching for thieves. I like to have a box of freebies available at my garage sale. This is the stuff I don’t feel like haggling over, may be missing pieces or need repair. I rarely have any of it left. If you’re really ambitious you could do grilled hot dogs (I saw this once but never have tried it personally). Have a plan for leftovers when the yard sale is over. Many companies will come and pick up your yard sale leftover items at a specified time. So make that plan in advance and do not bring the clutter back into your home. The only caveat to that is if you are planning to have a 2nd day or 2nd weekend to your tag sale. Garage Sale Tip #10 – Where is the Money Going? I always like to have a goal in mind for the money we make at our tag sales. Maybe savings for a vacation, a new couch, home repairs, etc. But a goal and a plan makes all the prep work and sales worth it! I hope these tips give you the confidence to have a yard sale, no matter what you goals for the money. I love to have the once or twice a year to keep the clutter down around the house. Rosemary cedarwood shampoo bars are easy to make and a quick DIY recipe that you can make for friends and family! This is a melt and pour shampoo bar so if you’ve been afraid to work with lye then this is the recipe for you! There is lye in the soap base, but you won’t have to work with it directly. The best part about melt and pour shampoo bars is that that you can make in a flash! 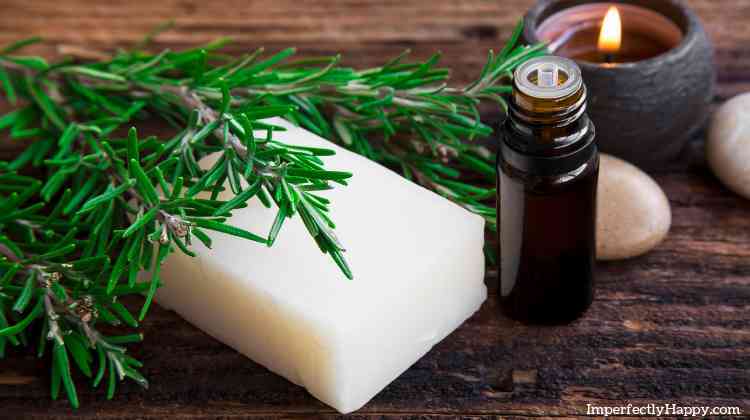 These rosemary cedarwood shampoo bars are quick to make and need no curing. I have found that men particularly love the natural, woodsy, scent of these rosemary cedarwood shampoo bars. People love getting these shampoo bar recipes as gifts too! You can package them with just a little ribbon or put a soap bar box with a cute sticker. Why Shampoo Bars Instead of Liquid? Great question! Shampoo bars are first and foremost, portable. This makes them great for travelers (no worry on limited liquid size), campers and those who want less waste in package (these require none). These melt and pour shampoo bars last a long time and there is less waste than with a traditional liquid shampoo. Even if this shampoo bar doesn’t become your daily hair cleansing go-to they are great to have on hand! 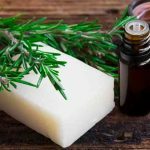 Why Rosemary and Cedarwood Essential Oils? Rosemary essential oil is said to aid in stimulating hair growing, promote circulation and ease dry and itchy scalps or dandruff. Cedarwood essential oil is said to help those with thinning hair and alopecia by stimulating the hair follicles and circulation. Looking for More Melt and Pour Soaps? More DIY Articles You Might Love! Don’t Miss My Latest Homemade Recipes!